The clocks went backs recently and the nights are drawing in. Plenty of visitors arrive in Newquay at this time of year, hardy types who don’t mind the warm, wet Cornish winter weather. They enjoy the peaceful beaches and coastline, studded with awe-inspiring walks and much less crowded at this time of year. And there’s lots to do in town through November, including the WAX firework display on Saturday 3rd November from 19:00 – 22:00, the biggest and best yet. We’ve closed our cosy Newquay B & B until spring, enjoying a well-earned rest. But what about the news from Newquay for November? Here’s what’s been going on recently in our lovely little holiday town. We’re thrilled to see the news about a new tech, food and community space whose mission is to generate economic growth for the whole of Cornwall. The Cornwall Food Foundation already manages the Fifteen Cornwall restaurant and apprentice chef programme at Watergate Bay. They’re also behind the Real Ideas Organisation, which develops creative, multi-use spaces to support social enterprise. Now they’re moving into the Hotel Sunnyside, together with Crowdfunder, to create a unique ‘C-Space’. Crowdfunder is determined to move all 30 staff to the new site before Christmas, and the other organisations will contribute 10 more staff to the mix. It looks like they could easily create around 80 new jobs in the next five years, thanks to supporting 1000 new Cornish start-ups. The body of a leatherback turtle has been found washed up on Tolcarne beach, near Newquay, and it’s the third time it has happened in 2018. The first was in August out at Longrock, near Marazion, and another turned up at Polkerris. Leatherbacks are the biggest type of turtle and usually live in tropical and sub-tropical waters. They eat jellyfish and other soft prey. This one had what looked like propeller cuts on its body, but it’s impossible to tell whether they happened before or after the animal died. Why are these turtles turning up dead on our beaches? Nobody knows, but climate change might be the culprit. Cornwall Airport is set to improve its links to London next year when Stobart Air, a franchise partner of Flybe, launches year-round flights from London Southend on 1st April next year, adding to their existing flights to and from Gatwick. At first we’ll see five more flights a week coming in. The new service will go daily on 1st May. The aircraft will fly under the Flybe brand and will use reliable French-Italian 72-seat ATR 72 planes. The new route replaces the old Flybe link between Newquay and Stansted. It matters because the first 8 months of 2018 saw more than 119,000 passengers flying between Newquay Airport and Gatwick, 12.8% more than 2017. And it’s great news since London Southend has been awarded the honour of being capital’s favourite Airport and the Which? Best Airport for London six years running. Passengers will be able to get from their plane to the train in just 15 minutes, and there are regular trains to the capital. All this means you’ll be able to get from London Southend airport to the capital itself in just over 60 minutes. 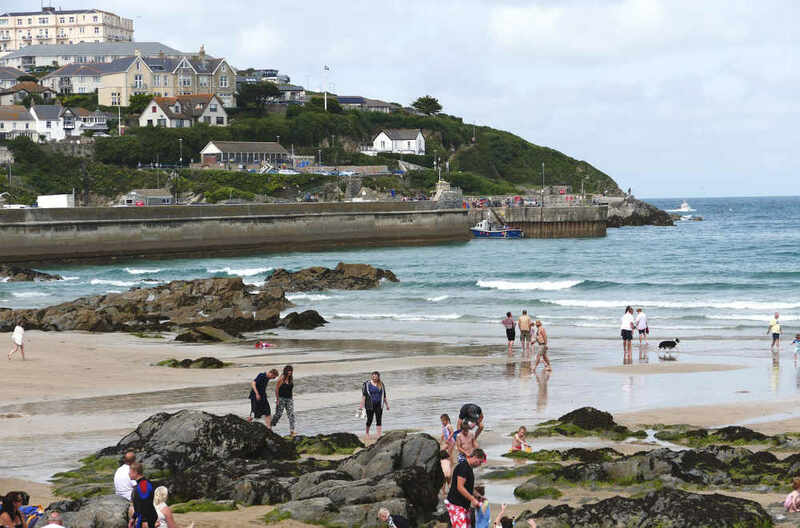 The dilapidated section of Newquay Harbour won’t be dilapidated for much longer! Plans are afoot to repair the Grade II-listed pier head at North Quay following investigations revealing it was in poor condition, suffering from several worrying vertical cracks. Remedial works will repair sections of the steel sheet pile wall to prevent the seas from causing it to collapse. The work will mean cutting deep into the seabed to drive in metal sheets and piles, before adding tons of poured concrete to provide a new layer of protection. The work will take place partly from a barge and should be completed by summer 2019. Newquay bed and breakfasts tend to fill up pretty quickly, with bookings already arriving for summer 2019. If you’d like to secure a week or two in this delightful summer surfing haven of a town, we’ll be delighted to reserve space for you.